As one of the first airport terminal projects in the world to target LEED certification, the Living Wall demonstrates EIA's commitment to sustainable design. In addition, it is a spectacular centrepiece to the terminal and has been integrated into the architecture. It has been strategically located so that it can be enjoyed by both arriving and departing passengers. The main central wall is 1,120 square feet and the left and right upper walls are 160 square feet and 140 square feet, respectively. This gives a total vertical green area of 1,420 square feet. How many plants are in the design? There are approximately 8000 individual plants, reflecting 32 unique species. What kinds of plants are used? Some are larger specimens including an Octopus Tree (Schefflera actinophylla) from Papua New Guinea, Lacy Tree Philodendron (Philodendron bipinnatifidum) from Brazil, Swiss Cheese Plant (Monstera deliciosa) from Central America and a Staghorn Fern (Platycerium bifurcatum ) from Indonesia. Small to medium sized plants were chosen to create the patterns. The design includes Asparagus plumosus and although it is commonly referred to as Asparagus Fern it is not actually a fern. Nevertheless, this South African native provides a delicate refuge for the eye. Epopremnum aureum ‘Neon’ produces a strong yellow pop whereas the two Bromeliad species (Nidularium and Vriesea) wow with their unique and alluring beauty. The watering is automatic and only comes on for a few minutes per day. There is a drip irrigation system within the living walls that percolates down through the layers of recycled fibres. What does it do in the way of cleaning the air? The thousands of plants add tons of oxygen to the terminal each year as well as absorb toxic indoor air pollutants such as carbon dioxide, benzene, and volatile organic compounds (VOCs). The National Aeronautics and Space Administration (NASA) did a number of studies to find the most efficient way to remove toxins up on space stations and found that indoor plants were more efficient than mechanical air filters. They found that 10 species were exceptionally good at purifying the air. The EIA Living Wall contains 9 out of 10 of these species. A mechanical scissor lift is used to access the wall. Maintenance involves trimming back the plants as they grow and removing flowers that have finished blooming. This is one of the largest Living Walls in Canada and to our knowledge the first and the largest inside any airport terminal in the world. Many of the plant species chosen are epiphytes, which means that in their natural habitat they live above the ground and without any soil. They are typically found growing in just a layer of moss on the side of a cliff, next to a waterfall or on tree branches. The Green over Grey Living Wall System most closely mimics this environment. All the soil is removed from the plants before they are installed in the wall. The verdant masterpiece will continually evolve on the canvas to become more and more three dimensional. Some of the larger species will be allowed to grow up to ten feet out of the wall. There are no space limitations for the roots which are free to grow everywhere within the wall. Plants, especially the larger bushes, will eventually form a strong matrix within the fabric, making the system stronger as it ages. The fully planted system weighs only 3 to 4 pounds per square foot. The wall is made of 100% recycled materials. What inspired the living wall? The Living Wall is inspired by Cirrus cloud formations. Cloud formations make people dream and think of travel which perfectly fits the idea of an airport. The patterns on the wall are colourfully arranged to accentuate these cloud formations. The side walls are inspired by celebrated Canadian artists. The Group of Seven is most famous for its paintings inspired by the Canadian landscape and initiated the first major Canadian national art movement. Some of the Group of Seven created not only landscape paintings but also dabbled in abstract. Emily Carr (right wall) and Donald Flather (left wall) both exceptionally talented and featured here, were influenced by the work of the Group of Seven. 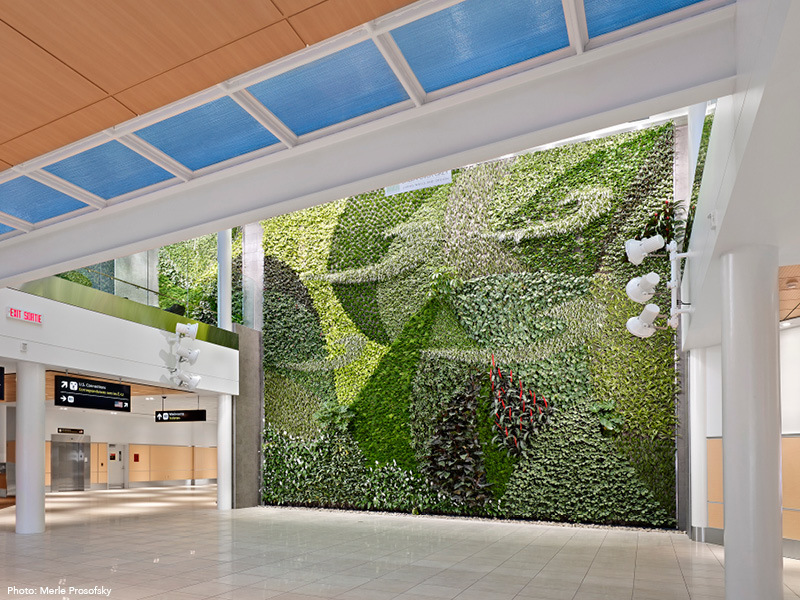 A great story can be told when welcoming international visitors to an airport that features, in addition to a unique and lush living wall, distinctly Canadian artwork. The designs are as true to the originals as botanically possible. The species are planted accordingly to the patterns but as the walls grow and mature the ‘paintings’ will evolve on the ‘canvas’, thus producing a verdant masterpiece that is ever-changing. 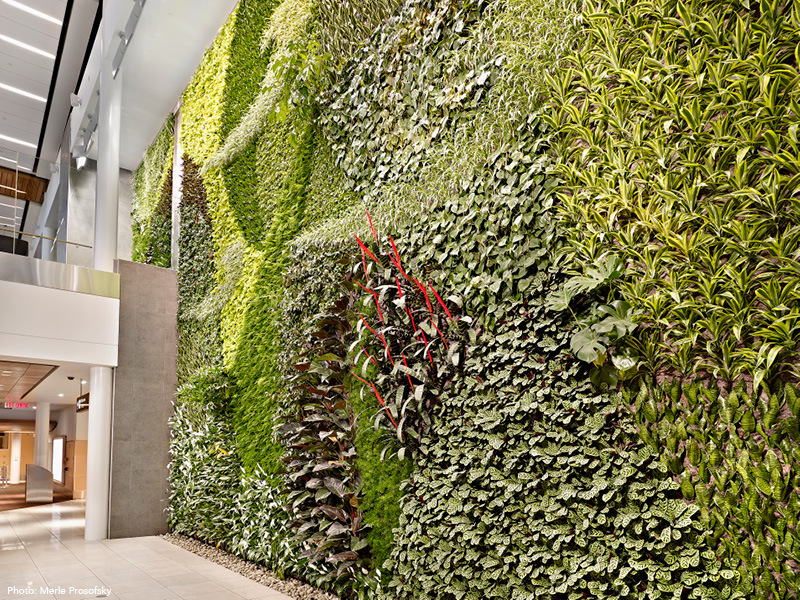 Mike Weinmaster, Chief Designer at Green over Grey – Living Walls & Design, has designed vertical gardens (also known as living walls or green walls) all across Canada and the US; including North America’s Largest. 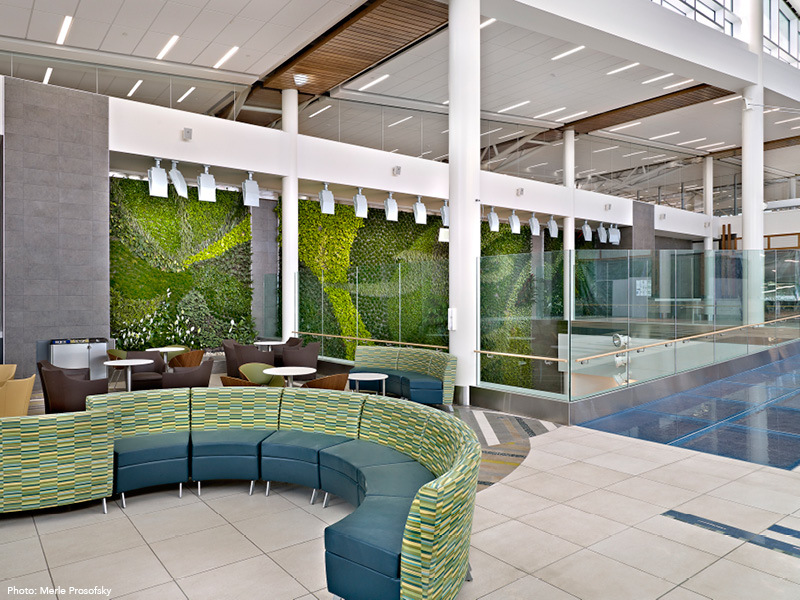 Most recently his designs for the living walls at Edmonton International Airport took inspiration from high altitude cloud formations (Cirrus) and air currents. 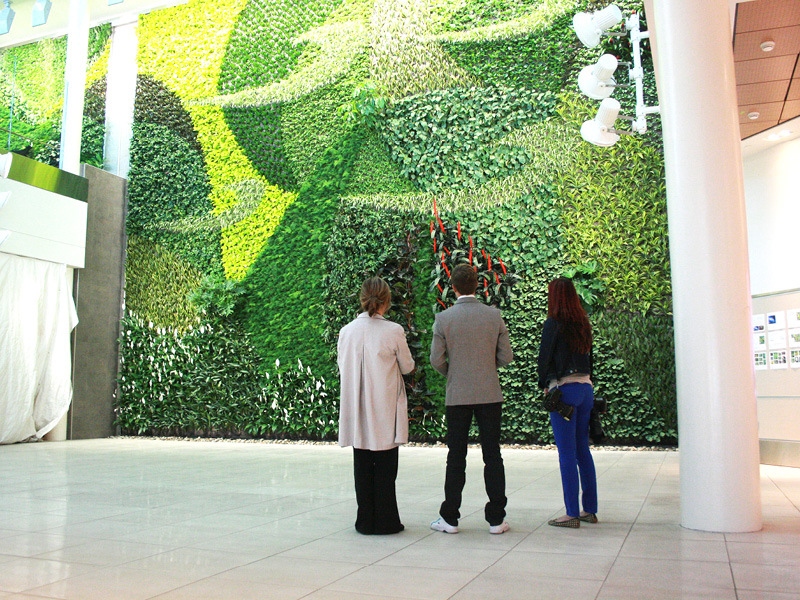 The other living walls at EIA were based on paintings by famous and celebrated Canadian artists. Mike has always been passionate about environmental issues and plants and this is what influenced his choice to do a Master of Science in Environmental Engineering and Sustainable Infrastructure with botany, ecology and horticulture as major components. He has completed extensive botanical research which brought him to the oldest rainforest in the world in Malaysia, the remote jungles of Papua New Guinea, humid cloud forests in Costa Rica and the temperate woods of British Columbia. He is continuously on a quest to find interesting and exotic species that he can integrate into his designs. These include plants such as epiphytes growing high above the ground, herbaceous species living next to waterfalls, vegetation growing on moist rocks, basically any flora that is adapted to vertical growth. Mike strongly believes that we must find new and innovative ways to better integrate nature into our ever expanding cityscapes. Green roofs and urban parks are one way to do this but there are substantial amounts of vertical space which for the most part is underutilized. Vertical gardens not only bring nature into city living and cover over unaesthetically pleasing walls, both inside and out, they do so in a way that is accessible to everyone. In our modern society our connection to nature has sometimes been all but forgotten. Mike’s aim at Green over Grey is to reintroduce people to nature; get them excited. And not just to stare up at his patterns, placements and plant choices but to stare in awe of Nature herself. He gets great satisfaction in showcasing what she has so brilliantly created.